A new British company is developing an electrically powered version of the Falcomposite Furio kitplane fitted with two motors driving twin contra-rotating propellers. 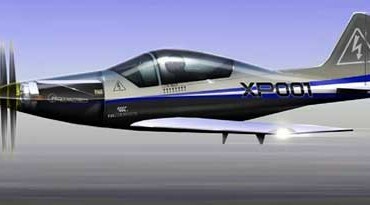 Contra Electric Propulsion (CEP) has been set up Nick Sills, formerly technical director of the Electric Lightning P1 single-seat pylon racer, to develop the power unit. “The CEP development is a bolt-on self-contained twin-engine contra-rotating fixed pitch 300hp system for existing piston engine light aircraft,” Nick told FLYER. The Furio, made by New Zealand company Falcomposite, is designed to take piston engines up to 300bhp. It’s based on a design by legendary Italian engineer Stello Frati. The prototype Contra Electric Propulsion System (CRPS) will be manufactured by Potenza Ltd, a Coventry-based company which is a leader in electric and hybrid power units. Potenza will also provide a test rig, battery pack, ancillaries and instrumentation to undertake ground tests, with delivery due in December. The contra-rotating props will be suppled by Hercules Propellers which has already manufactured similar items for the Bugatti 100P project. * The small size of the propulsion system has a huge effect on the shape/profile of the aircraft nose improving the aerodynamics.